“I think I’m gonna cry.” CBS has just released a new promo for season two of Kevin Can Wait. As reported earlier, the new season will take place after the death of Donna Gable (Erinn Hayes). After season one, Hayes was fired from the comedy and will be replaced by Leah Remini. 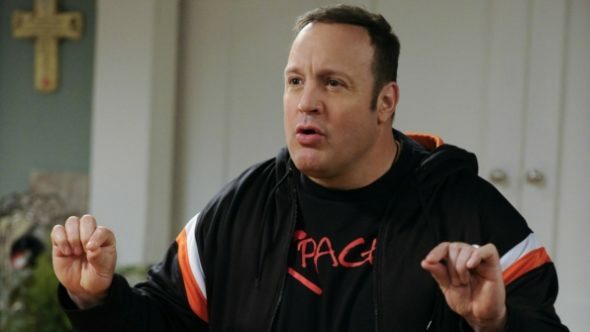 The cast also includes Kevin James, Mary-Charles Jones, James DiGiacomo, Taylor Spreitler, Ryan Cartwright, Leonard Earl Howze, Gary Valentine, and Lenny Venito. Season two of Kevin Can Wait premieres on CBS on September 25th at 9 p.m. ET/PT. What do you think? Did you watch season one of Kevin Can Wait? Will you watch season two? Have definitely removed this one from my watch list. The show was only OK last season, but killing the wife to bring in Leah Remini? REALLY?? Am so NOT going to watch. Not sure if I will as the first wife did a good job and don’t know why she was fired in the first place? Yes many of us to because of how they killed off his old wife. What a nightmare That shouldn’t of happened to start with. The show might not make it no matter how much hype in gas if it’s given. There’s too many times for replacement actors or actresses have been replaced in the show failed. This doesn’t look good.! I will not be watching Kevin can wait. Very unhappy the way. They have handled getting rid of his first wife. Dirty pool. After the forced death of th be sides character I am going to take s hard pass on this show. I will not be watching as I don’t feel Erin Hayes was treated right.